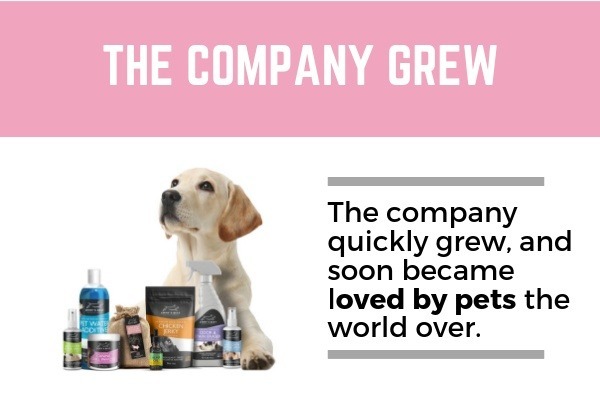 This is the story of a company named after Emmy the dog. 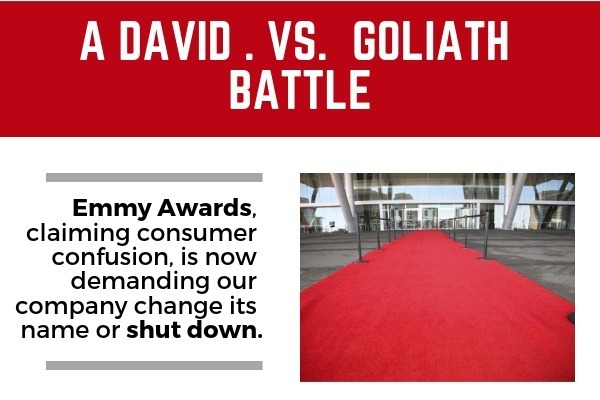 Now, the Emmy Awards are trying to force the company to change its name or shut down. It's the ultimate David vs. Goliath battle, one that exposes how often large, powerful organizations can bully small family-run companies. Now, as Emmy (the dog) battles cancer in her final days, the owners of this pet products company need your help. 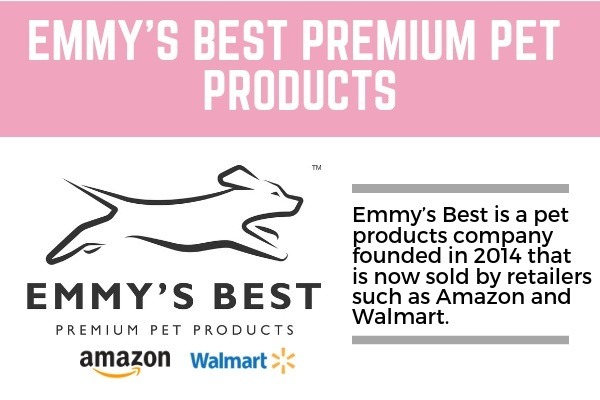 We started Emmy's Best Premium Pet Products in 2014 with a dream to provide quality pet products produced in the USA to loving pet parents everywhere. Today, our products are loved the world over and are sold by popular retailers such as Amazon, Walmart, and Chewy. We've served hundreds of thousands of customers, some of whom have even said we make "the world's best dog treats'. So why are we being challenged by The National Academy of Television Arts and Sciences, the organization behind the Emmy Awards? Well, they contend that our name may confuse consumers - that they wouldn't be able to distinguish between an awards show and a pet products company named after a dog. It may seem crazy, and at first, we thought it was too. In the past year, however, their opposition has become more fierce, and their demands even more harmful to our small business. 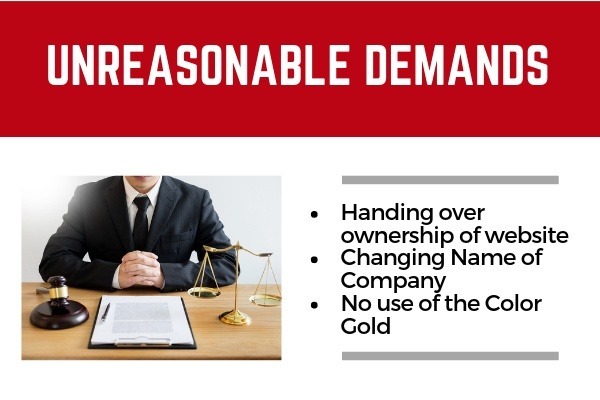 They are demanding things that would cause irreversible damage to our company's ability to operate should we give in. Now it is March 17, 2019, and Emmy is in her final days. 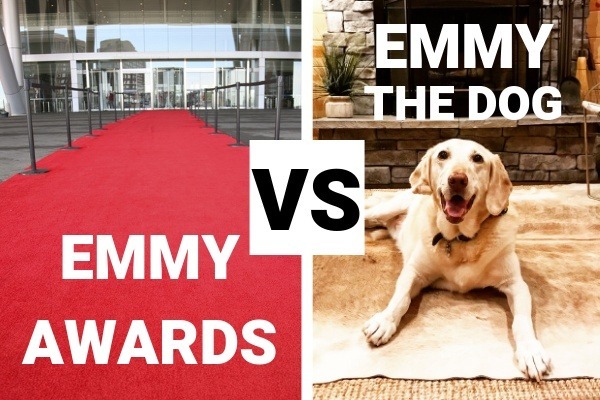 As we prepare to say goodbye, we're facing another battle - a legal one with a large and powerful organization trying to bully us into submission, all because of the name "Emmy". Our legal fees continue to mount, and will likely reach six-figures. This unfortunate battle is taking a toll on our small business, diverting resources away from running our business, and stealing the precious time we have left with Emmy. The reality is that this battle has the potential to end our business. Through all of this, we will continue to fight. That drive comes not from our own determination, but because of what "Emmy" means to us. 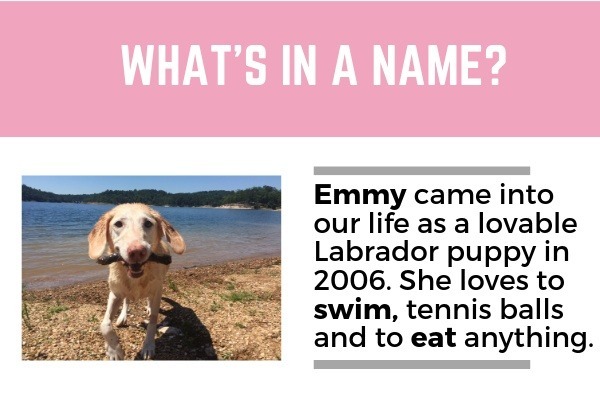 For the first years of her life, Emmy was simply a lovable, insatiable, mischievous white Labrador Retriever. She was adopted from a stranger from the back of a pickup truck in a Walmart parking lot. She had no papers and was not registered; she was simply a puppy in search of a home. After bringing her home, I needed a name. A friend suggested I name her after the actress Emmy Rossum, his celebrity crush. Another friend, knowing I had always dreamed of winning an award for my work behind the scenes in local television, agreed. This way "you would have your "Emmy", he said, and the name stuck. In 2014, when Emmy was 8-years-old, I decided to start a pet products company. Once again I needed a name - and this time it came easy! 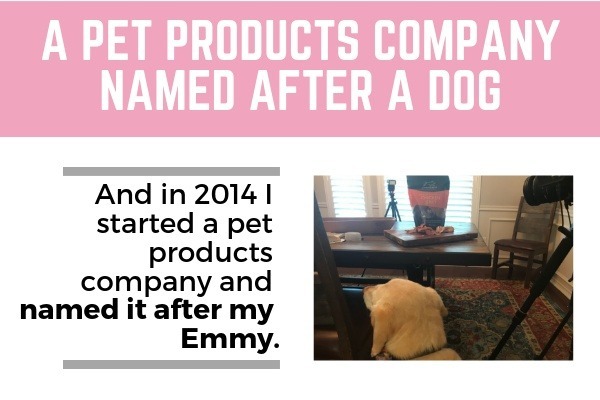 Emmy's Best Premium Pet Products, named after my Emmy, would become a company that sold quality products and placed an emphasis on customer service. To be honest, I thought, at first, it would be just a hobby. That hobby quickly grew into a full-blown business. In the five years since its founding, we've served over 200,000 customers the world over. Our customers have proclaimed that we make "the world's best dog treats" and that our Pet Odor & Stain Eraser "saved their marriage". 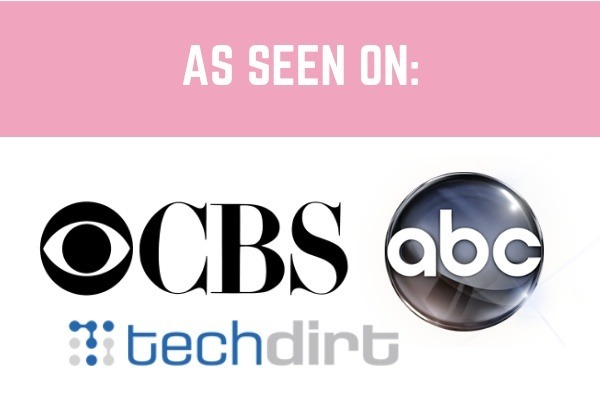 Our products are now sold through Amazon, Walmart, Chewy and are available throughout the US, in Europe and even Japan. In 2016, at the age of 9, Emmy was diagnosed with cancer. We were absolutely devastated at the thought of losing our family member, as well as the namesake of our young company. Emmy fought hard. Through the 16 weeks of chemotherapy, she never lost her will to live, and her insatiable love for life inspired her family and fans. After many months, the cancer was gone - remission. And we were grateful. Nearly a year after entering remission, the cancer returned, more aggressive than before. We feared the worst, but Emmy's medical team encouraged us not to give up hope. They still felt like we could beat this. We decided that as long as Emmy was willing to fight, we would fight alongside her. There was radiation, which almost took her from us, and then more chemotherapy. 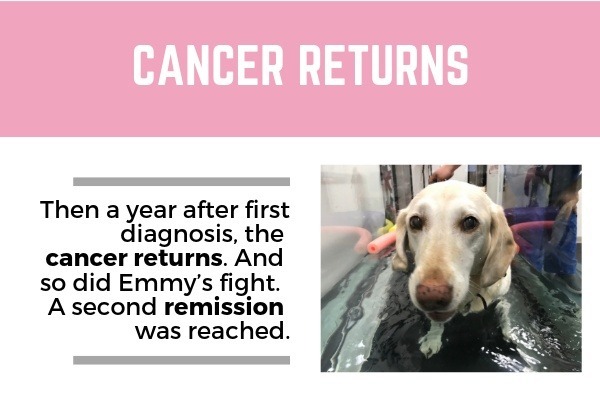 All the while, Emmy never lost her spirit, and for a second time, she beat cancer. Needless to say, we were elated. Emmy was now 12 years old, but still vibrant, swimming, loving walks and treats - and anything with her family. This dog was more than just the inspiration behind a company - she was teaching people everywhere about life. In August of 2018, we received more bad news. A new form of cancer was detected, and was non-operable given her age. To complicate matters, Emmy also has hip dysplasia, common in Labradors, as well as rapidly advancing arthritis. 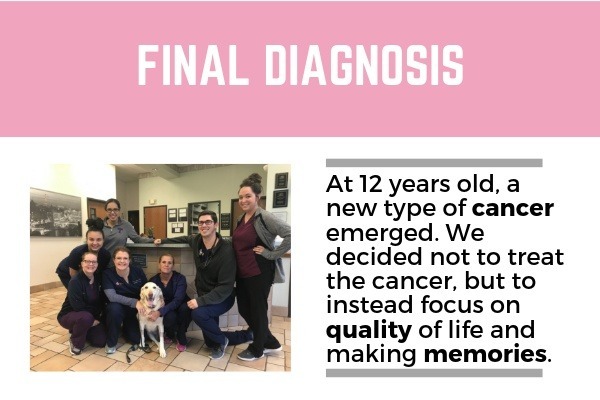 We decided as a family to no longer treat the cancer, but instead to focus on managing the symptoms and preserving her quality of life. We began a regimen of medications as well as physical therapy to help Emmy maintain her mobility. On the same day of the latest diagnosis, we received word from our attorney that settlement attempts with NATAS were not going well. He advised us to think seriously about how hard we were willing to fight this. Unfortunately, our negotiations have thus far only resulted in further unreasonable demands from the opposing side. We are asking for the support of our friends, family, customers, pet-lovers, believers in small business - and yes - complete strangers. Our legal bills are mounting and will continue to accrue. 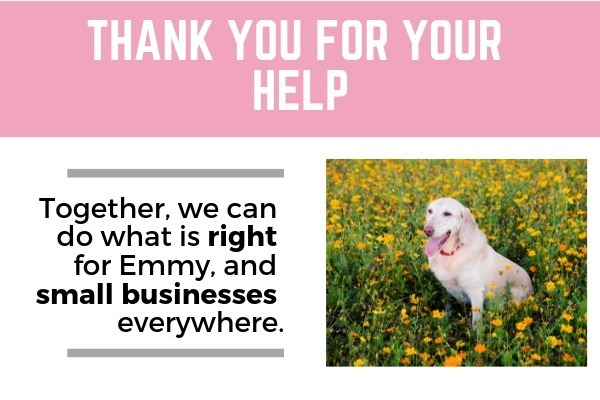 We want to fight for what we know is right - not just for our Emmy's memory and legacy, but because we believe that big, powerful organizations don't have the right to bully a small business just because they are more well known or have more resources. Do you agree? First of all, thank you for considering supporting us in this mission. - Any funds raised will first go towards the legal defense of our company. 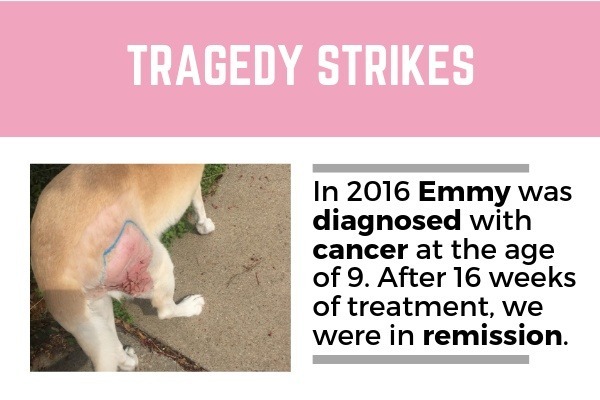 Thankfully, because of the help of pet insurance, Emmy's medical costs have been covered, and no assistance is needed for that. - Any funds raised that are not required for legal fees will be devoted to funding cancer research and treatment for pets. - We will develop an Advisory Board comprised of early donators to this cause, as well as Veterinarians and Not for Profit professionals. 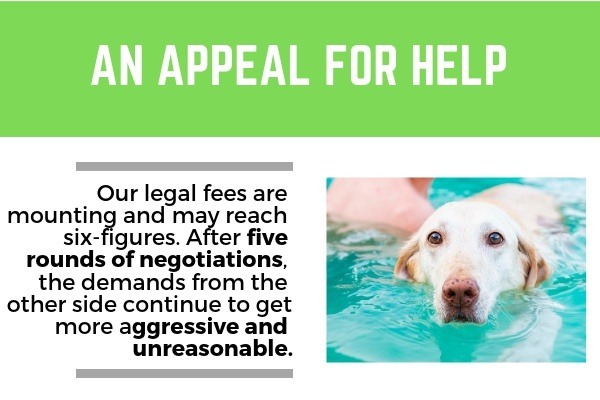 In the event that funds raised are not needed for legal fees, this Advisory Board will create a plan to use these funds to make a meaningful and lasting impact on cancer in pets in a sustainable way. We also want to hear from you. Please feel free to share your ideas in the comments, and make sure to share this page with those that you know who might be able to help. We are determined to ensuring our Emmy's legacy, not only as our beloved pet and the namesake of our company, but also one that continues to inspire and bring joy to pets and those who love them for many years to come. We will keep all supporters up to date with frequent updates on Emmy's journey, our legal battle, and how funds are being used. We cannot thank you enough for your consideration, support, and sharing! 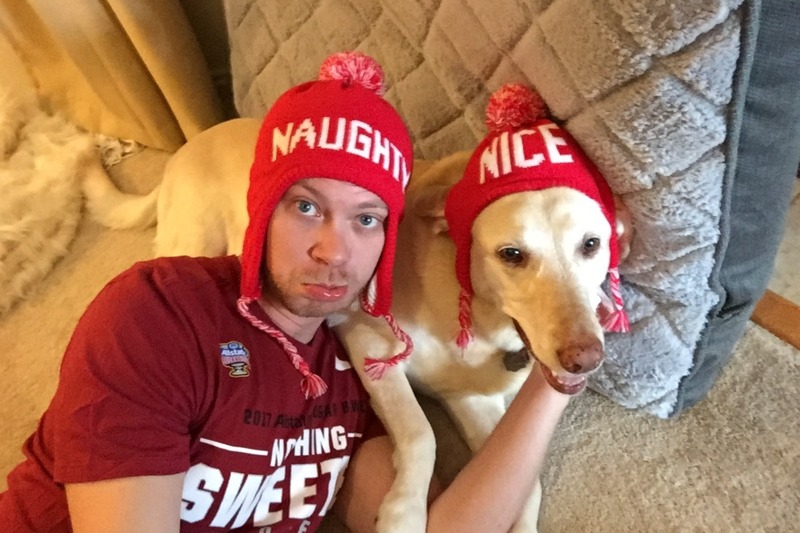 I want to give you an update on our legal battle, and on Emmy (The Dog). We have entered into an "Agreement in Principle" with NATAS (The Emmy Awards). This simply means that both sides have agreed to settle the matter, and have begun drafting the language to do so. While I cannot go into the details, I can share with you that we will continue to be able to operate, grow and thrive, with only minor changes to our name and branding. This was the goal all along - to be able to not only survive but to thrive! We're not quite there yet, as an agreement needs to be signed and executed, which may still take a few weeks. This progress is HUGE, however, and it's all thanks to you! We are so incredibly grateful for your thoughts, well wishes, prayers, spreading our message online, and your financial backing as well! We are continuing to incur legal expenses until this is all wrapped up, so if you do know of anyone that might be in a position to join us, we are appreciative. Emmy (The Dog) continues to live out her days in peace, surrounded by her family. She is loving the warm weather and spends a portion of every afternoon that it is not raining in the yard, sunbathing. We are grateful that she's still blessing us with her presence. I know I've been quiet over the past many days, and it's for good reason. There have been some developments on the legal front. Please keep us in your thoughts, prayers and good wishes. I can't say a lot right now, other than I hope that we are close to some resolution here. And also that we are so incredibly grateful to each and every one of you. Update!! It's March 28, a little over a week into our campaign. We've raised over $3,000 and our campaign has been shared over 500 times! We've been contacted by some National media outlets, and are hopeful our story will gain some exposure in the coming days. Just as important, an update from our Attorney reveals that NATAS (the Emmy Awards) have expressed a willingness to concede on two of the four remaining points of contention. I won't detail them here, because the nature of negotiations means that nothing is "done" until it's in writing and agreed to. Needless to say, our campaign is working! I truly feel that some continued momentum (through Go Fund Me, but also through some press exposure), will result in this being resolved soon. I can't thank you enough for your love and support. Every share, every donation, every message of encouragement means the world to us!! Emmy (the Dog) has begun to decline again over the past 24 hours. She has declined food and is not moving as freely on her own. It is too early to tell whether this is another false-alarm, as she has had many "down days" in the past months, or whether we are getting close to the end. Rest assured, she is comfortable, will not be allowed to suffer and we are all comforted that we are pursuing a worthwhile cause. Hi Everyone! Just a quick update. We've raised nearly $3,000 in our first week, and our campaign has been shared over 300 times! Thank you!! This is already helping to offset our legal fees, and we are incredibly grateful! We're not done, however. There remains a huge mountain ahead of us, and we're committed to climbing it one day at a time! 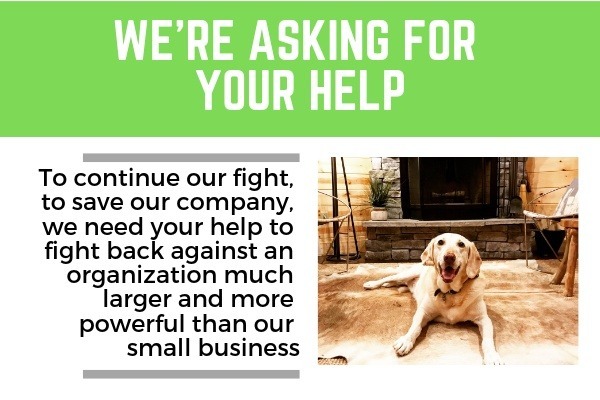 We're hoping to get some additional media exposure to help with our battle to save our company, and additional exposure for this campaign as well. Please continue to share our campaign, and we'll keep you updated as we progress!